Starch-iodine test. An iodine solution is applied to the sweaty area. After it dries, starch is sprinkled on the area. The starch-iodine combination turns a dark blue color wherever there is excess sweat. Paper test. Special paper is placed on the affected area to absorb the sweat, and then weighed. The heavier it weights, the more sweat has accumulated. Blood tests. These may be ordered if thyroid problems or other medical conditions are suspected. Imaging tests may be ordered if a tumor is suspected. Location. Does it occur on your face, palms, or armpits, or all over the body? Time pattern. Does it occur at night? Did it begin suddenly? Triggers. Does the sweating occur when you are reminded of something that upsets you (such as a traumatic event)? Other symptoms. Weight loss, pounding heartbeat, cold or clammy hands, fever, lack of appetite. Antiperspirants. Excessive sweating may be controlled with strong antiperspirants, which plug the sweat ducts. Products containing 10% to 20% aluminum chloride hexahydrate are the first line of treatment for underarm sweating. Some people may be prescribed a product containing a higher dose of aluminum chloride, which is applied nightly onto the affected areas. Antiperspirants can cause skin irritation, and large doses of aluminum chloride can damage clothing. Note: Deodorants do not prevent sweating, but are helpful in reducing body odor. Medicines. Medicines may prevent stimulation of sweat glands. These are prescribed for certain types of hyperhidrosis such as excessive sweating of the face. Medicines have side effects and are not right for everyone. Iontophoresis. 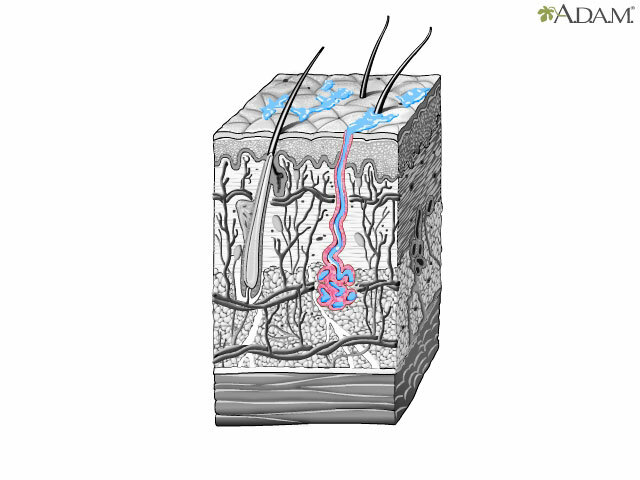 This procedure uses electricity to temporarily turn off the sweat gland. It is most effective for sweating of the hands and feet. The hands or feet are placed into water, and then a gentle current of electricity is passed through it. The electricity is gradually increased until the person feels a light tingling sensation. The therapy lasts about 10 to 30 minutes and requires several sessions. Side effects, although rare, include skin cracking and blisters. Botox. Botulinum toxin type A (Botox) is used to treat severe underarm, palmar, and plantar sweating. This condition is called primary axillary hyperhidrosis. Botulinum toxin injected into the underarm temporarily blocks the nerves that stimulate sweating. Side effects include injection-site pain and flu-like symptoms. Botox used for sweating of the palms can cause mild, but temporary weakness and intense pain. Endoscopic thoracic sympathectomy (ETS). In severe cases, a minimally-invasive surgical procedure called sympathectomy may be recommended when other treatments do not work. The procedure cuts a nerve, turning off the signal that tells the body to sweat excessively. It is usually done on people whose palms sweat much more heavily than normal. It may also be used to treat extreme sweating of the face. ETS does not work as well for those with excessive armpit sweating. Underarm surgery. This is surgery to remove the sweat glands in the armpits. Methods used include laser, curettage (scraping), excision (cutting), or liposuction. These procedures are done using local anesthesia. With treatment, hyperhidrosis can be managed. Your provider can discuss treatment options with you. That is prolonged, excessive, and unexplained. With or followed by chest pain or pressure. That occurs mostly during sleep. With fever, weight loss, chest pain, shortness of breath, or a rapid, pounding heartbeat. These symptoms may be a sign of an underlying disease, such as overactive thyroid.